HomeAlso in this issueNew alternative? December 2016 Lois Harris Also in this issue, Production Comments Off on New alternative? A NEW INSECTICIDE seed treatment made by DuPont will be used on the vast majority of corn sold by Pioneer in Ontario next season, according to Russ Barker, a Pioneer sales representative and Certified Crop Adviser. This could be an option for farmers looking for a substitute for neonicotinoids. Lumivia was registered by the Pest Management Regulatory Agency (PMRA) in April and will be available for the 2017 growing season. Lumivia, used in combination with other insecticides, has been used for three seasons in the U.S. with good results. Pioneer says that in 2015, U.S. yields for their PPST 250 treated seeds combined with Lumivia were up an average of 2.5 bushels per acre. Barker says that the product is applied to seed at a lower rate in the U.S. because it is blended with a neonicotinoid. This means that Ontario farmers can’t expect a direct correlation of results. However, Barker suggests that the Canadian formulation “provides similar control to neonics when it comes to pests that harass our corn”. The treatment protects corn against wireworm, black cutworm, seed corn maggots, and armyworms. Its novel active ingredient, Rynaxypyr (chlorantraniliprole), belongs to the anthranilic diamide class of chemistry, which acts on the pest insect’s muscle, unlike most other chemicals, which work on the nervous system. It belongs to the Chemical Group 28 insecticides, along with other products on the market like Coragen, Voliam Xpress, Fortenza, and Lumiderm. 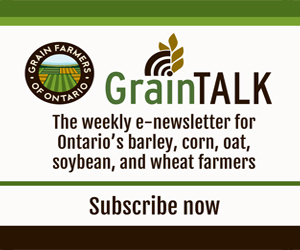 Ben Rosser, field crop corn program lead with the Ontario Ministry of Agriculture, Food and Rural Affairs, cautions that it’s important for farmers to know what pests are creating the most difficulty in their fields and talk to their seed suppliers about which product would be most appropriate. “You have to have a good understanding of the pests that you want to control, and then select the product that’s best for taking care of those pests,” he says. As with any new input option, there are added costs to using alternative products. Farmers need to evaluate if this higher cost option fits with their farm business and management plan and offers the level of control they require. “Pesticides generally have a 10-year development horizon,” says Kristin Hacault, DuPont’s seed treatment sales and marketing leader for Canada, noting that years are spent in the laboratory and then in testing for efficacy, user safety, and environmental effects. The final stage is registration with the PMRA, which reviews all the studies conducted and data collected by the company to find out if the product can be safely used. The review in this case took two years to complete. In Ontario, Lumivia is a Class 2 pesticide under the Pesticides Act, putting it in the same category as many other agricultural pesticides. This classification is encouraging for Ontario farmers, as the new regulations for neonicotinoids designates them a Class 12 pesticide, resulting in the restrictions and documentation farmers are now challenged with.